A simply great hardware load that guarantees high-quality images. ust before the best holidays of the year, make sure you have the proper equipment to capture the joy around the Christmas tree and the smiles of your friends and family. Or you have planned a special Christmas travel to a beautiful winter resort? Turn all those moments and beautiful places into an unforgettable memory with Canon’s new Powershot SX240HS. It is here to replace its predecessor the SX230 HS model as a new travel-zoom camera that provides all the necessary optical specifications to be your true travel buddy. 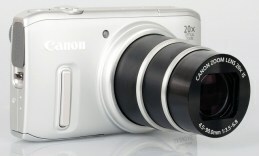 This point-and-shoot design provides comfortable shape and size so that you take pictures with comfort and style. The built quality features a solid mixture of plastic and metal which makes the construction solid and sturdy so that it protects the optics from knocks and accidental drops. The ergonomic design also includes a special handgrip for further balance. The curved edges and the lightweight of only 231g make it a compact shooting companion. The case is available in silver, black and pink colors. This new SX240HS camera is equipped with 12.1MP back-illuminated CMOS sensor facilitated by a DIGIC 5 image processing engine. The image quality is 4000×3000 pixels. The 20x times optical zoom make it a rather powerful shooting tool. The aperture on its part has a range from f/3.4 to f/6.8, which doesn’t provide a considerable freedom for speed and aperture experiments but it’s a non-professional snap snap camera after all. The maximum shutter speed is 1/3200 and the minimum – 15sec. At least you are compensated with the tele lens abilities of the optics. This potential is provided by the 25-500mm optical zoom lens which is the most powerful feature of this camera. Smart Auto mode along with the built-in 4-stop image stabilizer and intelligent IS technology guarantees perfect results even if it is the first shot you make in your life. However, if you have some experience behind the camera, the SX240HS offers a full range of manual exposure modes. On this Canon model you can also make movies in FullHD quality with stereo sound at 24fps. The built-in software provides a number of creative filters to achieve the best possible results with your photos. It also features Scene detection technology, face identification. Along with 240fps super slow motion movie mode and the opposite 10.3fps burst shooting for awesome movie effects. The built-in pop-up flash is positioned on the left top corner of the case just above the lens. What can we sum up? A simply great hardware load that guarantees high-quality images. The ISO sensitivity varies from 100-1600. You can compose and view your photos on the 3’’ LCD display at 460 000 dot resolution widescreen format. The battery guarantees around 235 shots from a single full charge. The connection abilities of the Canon SX240HS include an HDMI port, USB, an AV and of course a card reader that supports Secure Digital, SDHC and SDXC formats.